Visitors would be significantly more interested in Macau if the street names were translated into English, a study conducted by the Macau University of Science Technology (MUST) claims. According to scholar Libo Yan, who coordinated the research, the translation of the street names – currently displayed in the MSAR’s two official languages, Chinese and Portuguese – could make tourist movements easier and increase their knowledge of the city’s history and heritage sites. “There is a fairly strong correlation between being interested in the street names and wanting to visit those streets. This research indicates that the understanding of the meaning of street names can foster the desire to visit them,” the study reads. According to research cited by the news agency, up until 1869 the street names were posted only in one language, which meant that some of the city areas were named in Portuguese (the so-called Christian city) and others in Chinese. Later the local government introduced bilingual signs, although the names in Portuguese and Chinese often weren’t direct translations. An example is ‘Julongli’ street (originally written only in Chinese script) that literally means “place where the dragons meet.” In Portuguese the adapted name was “Beco dos Cules” since the word “dragon” was used to name the “cules,” or coolies, workers who performed menial tasks. The study included a survey to visitors carried out between May 2 and June 14. The survey concluded that the tourists who don’t speak Chinese or Portuguese tend to be critical towards the lack of English signage. To add to this, 90 percent of the tourists coming from mainland China also shared that concern. Signposts providing information on Macau’s historical buildings – and displayed in four different languages – were placed near some of Macau’s busiest historical areas for the first time in 2010. With a simple yet modern design, the signposts were designed by architect Carlos Marreiros and not only provide information using Macau’s official languages, but also in English and Japanese. The first of these signposts was placed at Largo da Sé. Another 23 signposts were then placed near other famed buildings around town. 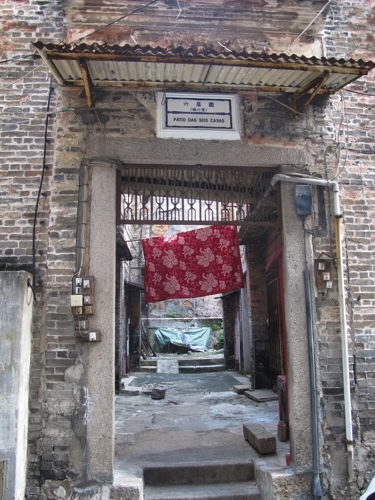 The signposts included the UNESCO World Heritage logo, the title “Macau Historical Center,” a designation of the listed monument, as well as a brief presentation of the building and its history. I disagree with scholars. Street names are like personal names. An object has personality expressed through own name. With translation, the main part of personality will gone, as well as charm connected to it. When it will be New Road and Cesspit Island instead of Av. Almeida Ribeiro and Taipa, it will sound not like about country with great heritage. I am Ukrainian, with only English knowledge. However, I never had problems with street names in either France, Germany, Spain or Macau. From my experience, the biggest problem for tourist in Macau are taxi drivers who had no knowledge of local Portuguese names. For me is no problem to remember, that I will have dinner on Avenida da Republica after visiting customer centre on Rua do Pequim, and go to sleep near Rua Felicidade. But it is not possible to find a taxi driver who would know what it is. In much, much bigger bilingual cities which had much less international tourists than Macau does, a complete knowledge of city street names are prerequisite for issuing taxi license.